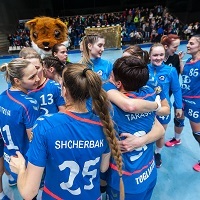 The Women's EHF Cup Quarter-final first legs all took place on Saturday afternoon and Russian side Lada were the only group winners to celebrate an away victory while the other games ended in favour of the home sides. For the Romanian side, reaching the quarter-final was already quite a success. Obviously, Craiova are eager to continue their good run and go even further, yet progression to the next stage appears unlikely following a two-goal home defeat. However, SCM should be credited for not giving up as the gap between the rivals could have been wider. Led by the competition's top scorer Daria Dmitrieva, Lada took an early control of the match and were up 8:4 and 13:9 before cruising to a comfortable six-goal lead (15:9) at half-time. It looked like the game was settled, but supported by a vocal home crowd, Craiova improved after the break and worked hard to cut the deficit. Florina Florianu had a particularly big impact and finished the game with eight goals, as many as Dmitrieva. However, the Russian side did not let their lead slip completely and they take a healthy two-goal lead into their home leg in Togliatti next Saturday. This highly anticipated clash of former EHF Champions League winners ended up being a bit more one-sided than expected as Viborg stormed the second half of this Scandinavian derby. Following a seven-goal win at home, Viborg have given themselves a very good chance of progressing to the semi-finals. However, Larvik are capable of pulling off a strong second-leg comeback at home. In Denmark, the Norwegian side had an awful start, scoring their first goal seven and a half minutes into the match. Viborg's defence and Rikke Poulsen between the posts stood firm, helping Viborg to a 7:1 lead, before the visitors settled into the match. As soon as Larvik found their rhythm, they quickly cut the deficit, scoring the last four goals of the first half to trail 9:8 at the break. The Norwegian team seemed to follow the right track as they drew level at 9:9 t the beginning of the second period, but Viborg enjoyed another good spell and pulled clear to lead 21:14. With Viborg’s solid defence and the likes of Line Uno Jensen, Carin Stromberg and Ann Grete Norgaard in attack, the Danish side will be optimistic ahead of their trip to Norway. This match started at the same time as the clash in Craiova, but this Romanian side enjoyed a more positive result. A one-goal advantage will hardly make Gheoghe Tadici's team the favourites for the second leg in Turkey, but Zalau may take pride in staying unbeatable on home court, where they also won all three matches in Group D.
Kastamonu, who had surprisingly topped their group in the previous round, enjoyed a better start, and their first-half advantage reached five goals (13:8). At the break, the Turkish team enjoyed a 15:12 lead, yet Zalau did not give up and seized the initiative in the second half. Roxana Rob and Andrada Trif were difficult to stop, scoring nine and seven goals respectively, playing a huge role in the home side turning the game around. After Zalau drew level at 19:19, it was an extremely tight and nervous match, which both teams could have won, yet lady luck smiled on the hosts this time around. Vipers coach Kenneth Gabrielsen was cautious before the game, claiming that his team should focus on winning the first leg by any possible margin, rather than thinking about racking up a big score. His team not only secured the win, but a nine-goal victory was the most convincing of the day. The Norwegian side, who paved their way to the quarter-finals following three wins in three last group games, extended their brilliant run, while Brest’s group victory counts for little now as their chances of progression are hanging by a thread. During the group phase, the French team's problems lay in attack as they scored the fewest among all quarter-finalists. This issue was laid bare once again as they scored just 17 times, while their defence could not keep them in the game. In the first half, Brest kept the match tight, going just two goals down at the break, but they had no answer for a superb second half performance by Kristiansand, who were led in attack by Kristine Lunde’s eight goals.